We are a long term solution! We guarantee our service with our 1-year warranty or optional 5-year warranty to your failing drainfield/septic system! The Trademark "Drainfield Restoration" is the property of Drainfield Restoration Services, inc. Copyright 2013. Don's Testimonial: 3 years ago we completely restored Don's drainfield and saved him $8,500! 3 years later his septic system is still working! Drainfield Restoration Services, Inc. has been fixing and restoring dead drainfields and septic systems for over 20 years in Bend Oregon. We provide septic repair service to the entire state of Oregon: Bend, Sisters, La Pine, Prineville, Madras, Eugene, Portland, Florence,Sunriver, Portland, Lincoln City, and the Oregon Coast. 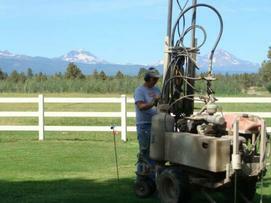 We also serve Idaho, Washington, California, Oregon to provide septic service. Most of the time you don't need a new drainfield and do not need to replace your septic system. We restore failed drainfields with our Terralift, Jetter, and Rooter Service. If you think you may need a new septic system, give us a call we can help!